From the Hancock County Courthouse, go east on Broad St. for 0.1 mile (for 2 blocks to the second traffic signal). Turn right on Boland St. and go 1.4 miles to the house on the left. Turn left into the driveway. Grave is 50' left of house near pecan tree. 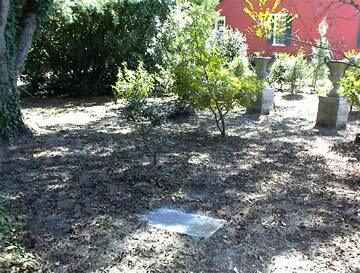 The only evidence of a cemetery is the broken gravestone of Henry Rogers. It may be that this gravestone has been displaced from its original location. No death date. Gravestone is broken. Only the top half of the gravestone is found. Gravestone may be displaced from its original location.